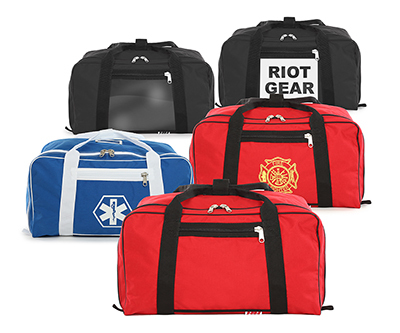 The EXTRA LARGE TURN OUT GEAR BAG is constructed the same as the regular turn out gear bag except it’s 25% taller. Plenty of room to spare after setting your boots and bunker pants on one side and coat and helmet on the other side. Made of Cordura® nylon. #200BK XL-WINDOW features a clear vinyl pocket that allows labeling by inserting a printed page. Measures 131⁄2” x 16” x 24”. 5,200 cu.in. Wt. 31 oz. Made in the USA.